With our visibility and governance platform added to your portfolio, you will promptly generate new business and gain upsell and cross-sell opportunities in the cloud security, data governance and IT compliance markets. Netwrix Auditor is the solution of choice across a wide range of industries, including healthcare, banking, education, government, pharma, retail, hospitality and energy. It covers the broadest range of on-premises and cloud IT systems and applications, and addresses the needs of the many different levels of the IT organization, from system administrator to CIO. 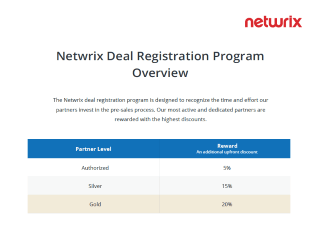 All this makes Netwrix Auditor an appropriate add-on to nearly every deal, enabling you to expand both incremental and recurring revenue streams by offering higher-value, comprehensive solutions to new and existing customers alike. Capitalize on the enterprise opportunities emerging in the fast-growing cloud security market. Netwrix Auditor is one-of-a-kind visibility and governance platform that helps solidify the security of on-premises, hybrid cloud and cloud IT environments. Add Netwrix Auditor to your offering to ensure peace of mind for your customers moving to the cloud. Drive revenue in lucrative markets like healthcare, finance, energy, legal and government by enabling organizations to meet regulatory requirements and pass compliance audits with far less effort and expense. If you already have customers subject to HIPAA, SOX, PCI DSS, GLBA, FISMA, FEPRA, NERC CIP, ISO/IEC 27001 or other regulatory standards, just add Netwrix Auditor to your offering to instantly extend its value. Leverage our best marketing materials to launch your own Netwrix marketing campaigns and fill your sales pipeline with new leads. 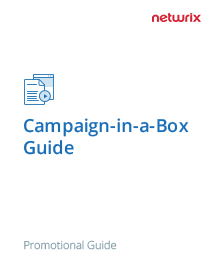 Each campaign-in-a-box contains all the assets needed for successful execution. 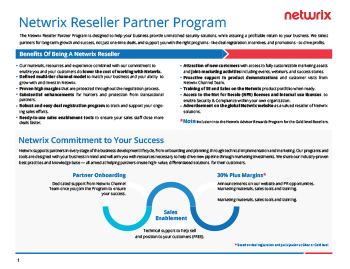 Explore the full list of Netwrix Reseller Partner Program benefits. 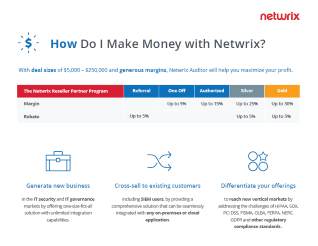 How Do I Make Money with Netwrix? Explore handy tips for selling Netwrix Auditor. Learn how to increase margins by registering deals with Netwrix. Regulators task our clients with knowing everything that is happening on their network. Netwrix offers tools that provide this insight. The wide range of reports fit the needs of the technical staff, management and the Board of Directors. In summary, the products are robust, they are easy to use and the reporting provides the necessary level of insight to those who play different roles across the organization. Senior Vice President, Sales & Marketing, AaSys Group, Inc.